When asked to make an anniversary card and told pink was his wife's favorite color, I realized I didn't have much pink and probably not enough to do an entire card. Surprise, I found one sheet of Blushing Bride so wanted to make as many cards with it as possible. Yesterday's card was made from half of the card stock. This one was inspired by the fact that, when I tried to tear it along a ruler with a decorative edge, it didn't go as well as I had hoped. When I accidentally bent and put a crease in that wasn't wanted, in frustration, I crumpled the whole thing in my hand. Then, smoothed it out and decided to see how I could use it. I am really liking the new stamp set, You Are Loved, from the Holiday Mini. And, come Wednesday, my order from the upcoming Occasions Mini Catalog and Sale-A-Bration Catalog will be here and I can start sharing some new and fantastic products with you. There are a lot of great new products and I already have several ideas in mind for some Valentine's Day cards and gifts. And, there you have it. 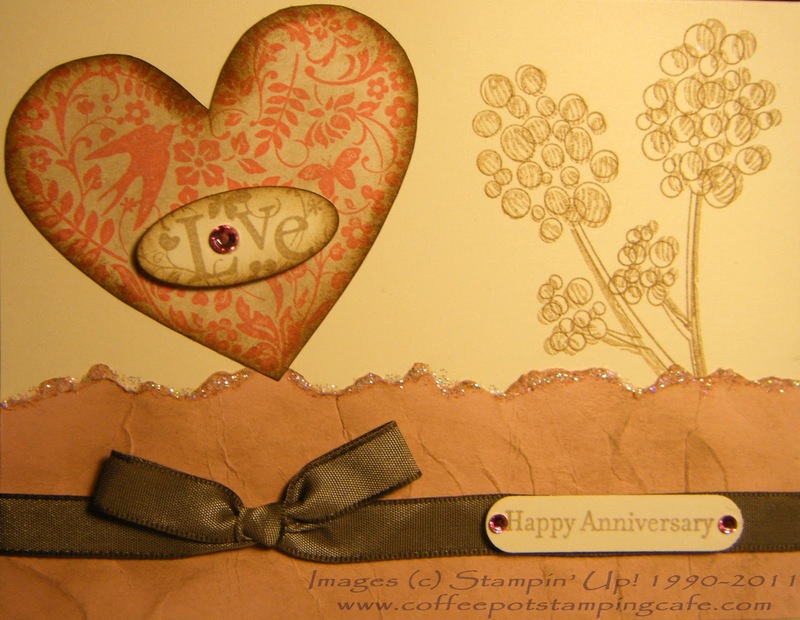 The second card made using the only sheet of Blushing Bride card stock on my shelf. Later, I'll show you the last one I made in the trio.